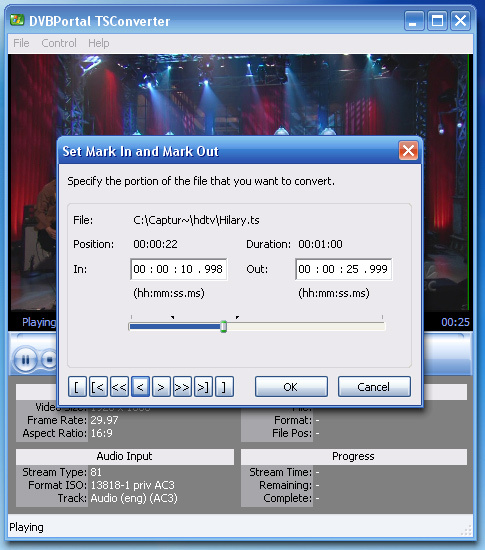 Being a native Windows format, DVR-MS is ideal for watching (Media Center Edition and Windows Media Player), streaming (XBox, Windows Media Connect) and encoding (Windows Media Encoding) up to high definition in 720p/1080p and 5.1 audio. Starting with version 1.1, TSConverter can also convert into MPEG-2 program streams and transport streams. An integrated A-B scene cutter allows the selection of favorite scenes. TSConverter is a powerful tool for content producers who want to create multi channel audio WMVHD titles from their TS sources. The provided samples on this page are produced in two steps. TS to DVR-MS conversion is done in minutes using TSConverter. The resulting DVR-MS file encodes perfectly to WMVHD using Windows Media Encoder (WME9).